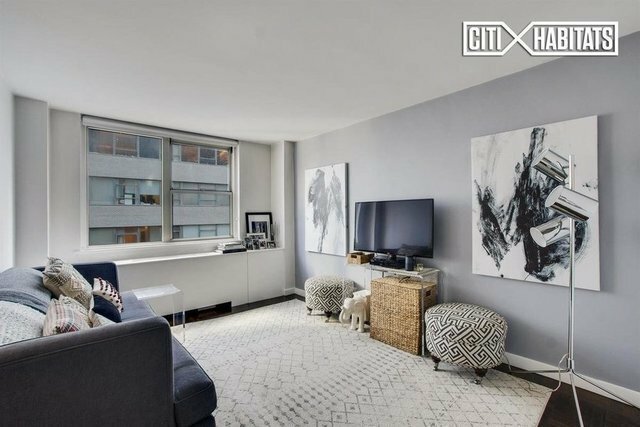 Pristine Expansive Two Bedroom CONDO located on the corner of Third Avenue in the heart of Midtown Manhattan that is simply unmatched. This corner apartment with not one, not two, but three exposures, North, East and South making it a bright happy home is simply a slice of paradise that checks off all the boxes. Starting with its oversized windows and NEW hardwood floors. The living room, with its wall to wall windows, is spacious and if the second bedroom is not needed, it makes a wonderful dining area. The walk-in renovated kitchen, with its eastern exposure window, is bathed each morning in sunlight radiating over its Open Breakfast Bar, Marble counter top, Glass Subway Tile backsplash, and Stainless Steel appliances, including a dishwasher, microwave, gas stove and full size refrigerator. The master bedroom, easily large enough for a King size bed, also offers endless sunlight with its sprawling windows and southern exposure, but, at the same time, is so quiet you will forget you live in the Center of it All. Both bedrooms have custom built closets and phenomenal room for storage. The renovated bathroom is sparkling as it is surrounded by white tile. Yet, the beauty of this home extends beyond its wall as The Blair House is a well-managed full-service Condo building with a full time doorman, newly renovated laundry room, newly landscaped roof deck, and a bicycle storage room. And, it is conveniently located near several subway lines, including the 4, 5, 6, N, R, W, Q, E and M lines, the 57th Street cross-town bus, restaurants, movie theaters, and shopping, including Bloomingdales and a Whole Foods Grocery literally around the corner. In short, the perfect apartment for a full-time residence, pied a terre or investment with easy Condo Board approval, low maintenance and pet friendly!